Party + Pancakes = Hash Kitchen - Yay Baby! I am not a morning person. I like sleeping in, especially on the weekends. But I’ll happily set my alarm on a Sunday for brunch at Hash Kitchen. Pretty much everyone I know raves about the place, but late-sleeper that I am, I delayed visiting. Now I am kicking myself for the time I lost being lazy when I could have been eating my way through their incredibly unique and delicious menu. WOW! 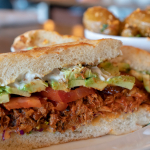 There are currently three Hash Kitchen locations (with a 4th coming soon) and I visited the Scottsdale location at Gainey Village. 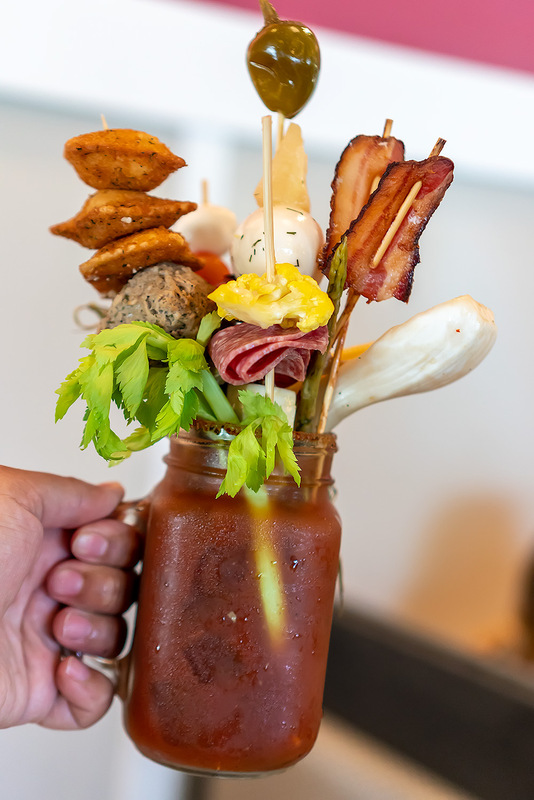 Upon walking in you are beckoned by the crown jewel of the joint, an impressive Build-Your-Own Bloody Mary Bar, a buffet of veggies, garnishes and hot hors d’oeuvres to gussy up your drink. My friend and I went a bit crazy and made a meal out of our Bloody Mary, piling in as much as we could –pickles, olives, baby corn, various pickled veggies, a beef stick, bacon and even fried raviolis and meatballs! It was fun to create and even more fun to drink and eat! If tomato juice and vodka aren’t your jam don’t miss out on Hash Kitchen’s mimosas. I suggest a flight to sample a variety of flavors. Or go big like I did and order the 25 Oz Mega Mimosa Boba Mimosa. WOW! 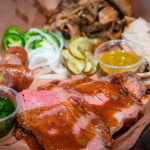 It’s brand new to the menu and I’m sure it’s going to be an instant hit. 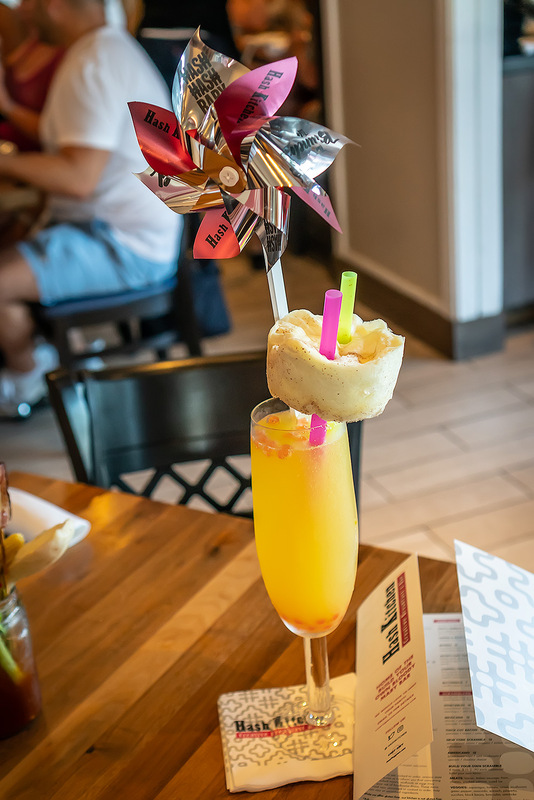 Served in a giant champagne flute, it’s made with an entire bottle of bubbly with your choice of fresh fruit puree and boba pearls. It’s garnished with a huge tuft of cotton candy and a pinwheel for a touch of whimsy. 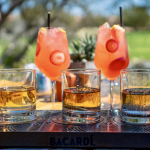 It’s a spectacle of a drink and jaws will drop as it’s delivered to your table. Speaking of new menu items, check out the Fruity Pebbles Pancakes. It’s basically like eating your favorite childhood cereal and the fluffiest pancakes together. A total win/win! 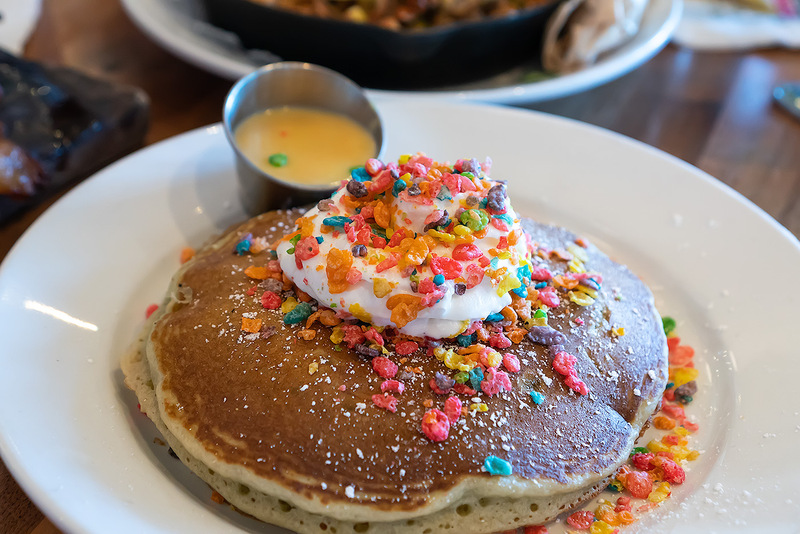 Hash Kitchen infuses their pancake batter with fruity pebbles and serves them up with whipped cream made with cereal milk. Talk about a morning sugar rush! We ordered a small stack to share and had them as our brunch dessert. 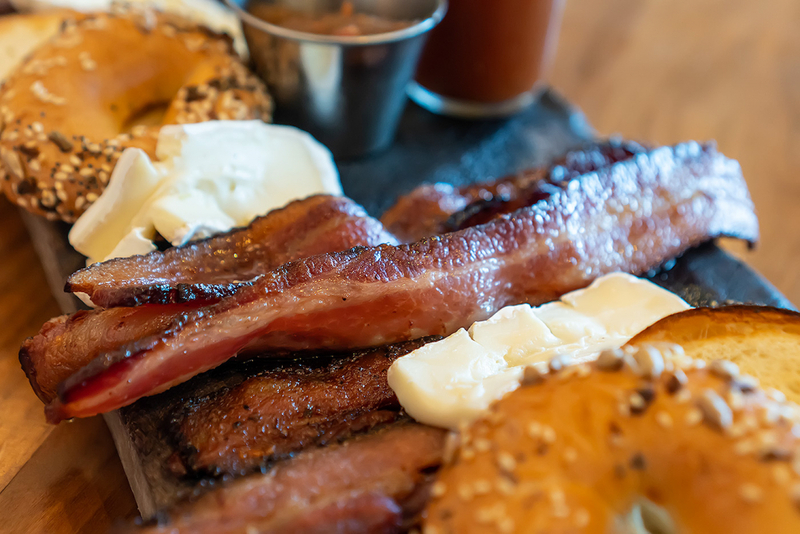 In addition to a great cocktail every brunch MUST include bacon; otherwise why bother? A Hash Kitchen MUST is the Craft Bacon Board featuring some of THE BEST BACON you will ever eat. 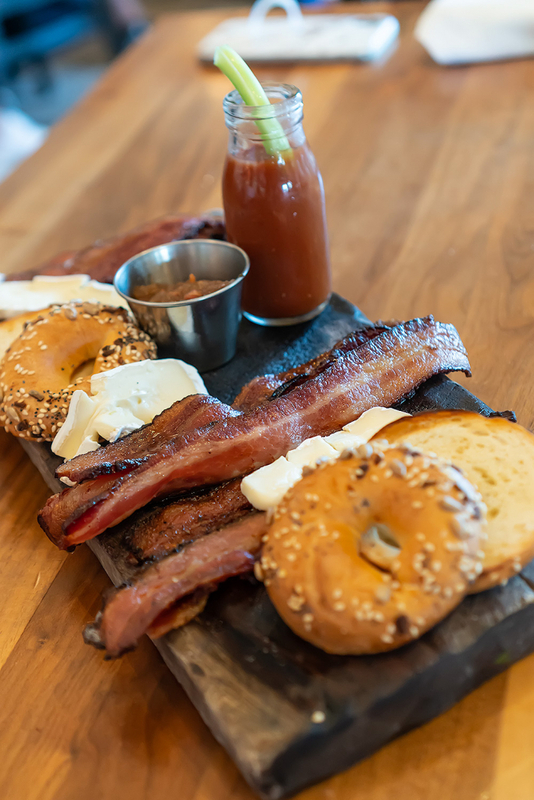 It comes with thick cut slices of brown sugar, jalapeño, and peppered bacon, housemade bacon jam, brie cheese and toasted mini bagels, plus a shooter of a non-alcoholic spicy Bloody Mary. I enjoyed making mini bacon and brie bagel sandwiches and dipping them in the shooter. SO GOOD! We ordered the bacon board as a starter but I’d be happy with it as my main course. As my main course I chose the Herbed Fried Chicken Benedict. 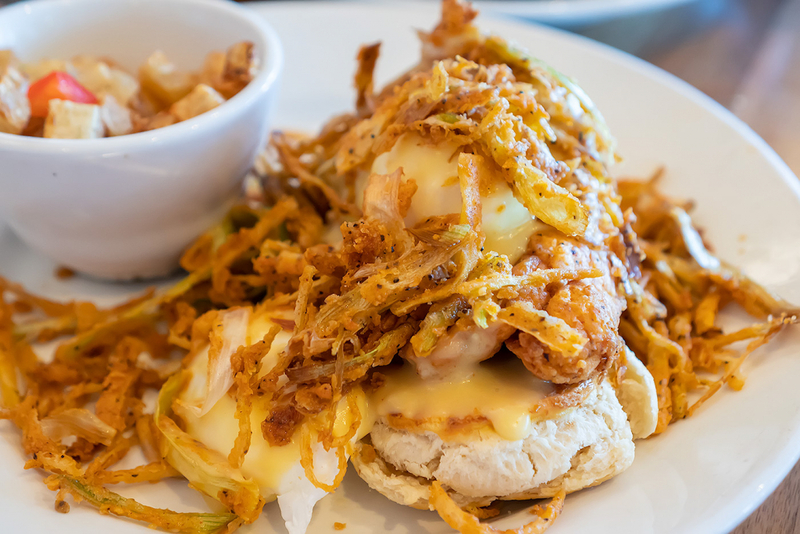 A juicy breast of crispy fried chicken battered and cooked to perfection sits atop buttery, flaky biscuits covered in a tangy Hollandaise and crowned with two poached eggs and crispy leeks. It was comfort food on steroids. 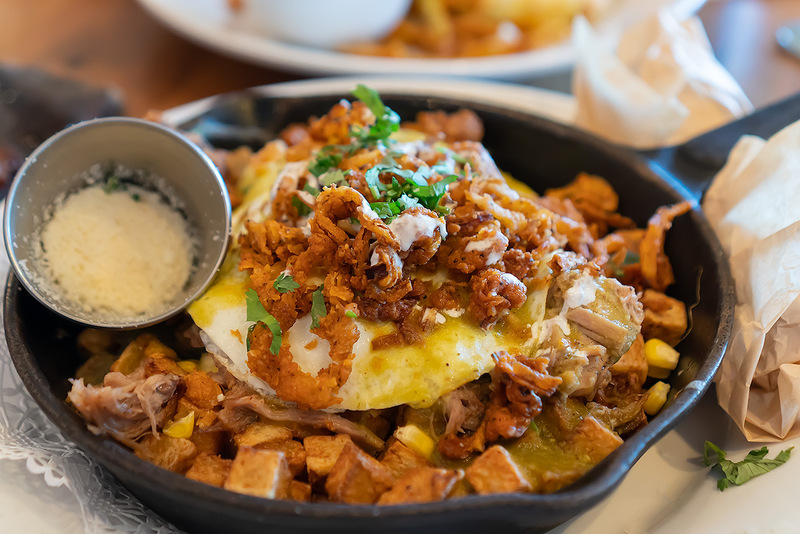 My friend ordered the Carnitas Hash and I can only assume it was delicious because she liked it so much she didn’t even share a bite! 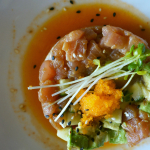 It came with a rave recommendation from our server who claimed it’s one of Hash Kitchen’s most popular dishes. I can see why because it looked and smelled amazing. 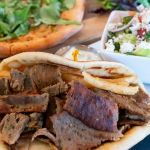 It’s on my list along with pretty much the entire menu to try next time. You better believe there will be a lot of next times. 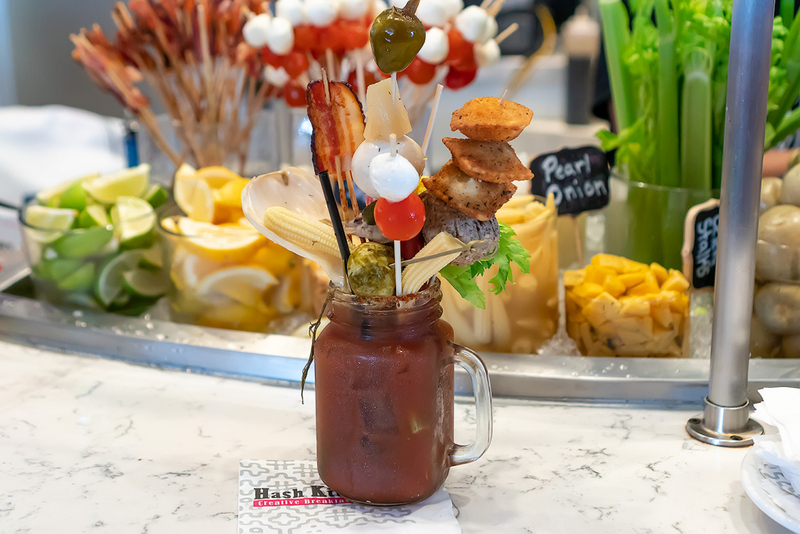 Hash Kitchen is the Valley’s premier brunch spot and I am so happy to find out what the hype is all about. It’s a great place with a hip, upbeat vibe. 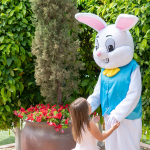 On the weekends a DJ spins at the Gainey Village location and brunch becomes an event. It’s such a fun atmosphere with bubbly servers, bubbly drinks and bacon! It really doesn’t get any better than that. Totally worth seeing my alarm for! Disclaimer: I enjoyed my meal free of charge at Hash Kitchen to help facilitate this post. All opinions are entirely my own.